All conveniently obtainable directly from my website. 8 February 2013 ... LATEST: Click here for a recent comprehensive review by a professional language practitioner and member of the SA Translators' Institute. Battling with kappies and deeltekens and other conventions relating to Afrikaans spelling? Help is here at last for non-mother-tongue users of Afrikaans, whether in the workplace, at school or in tertiary contexts – not to mention at home, where parents feel better when they know that they know more than their offspring during those "I don't understand this stuff" homework times! Click here for a review on LitNet (in Afrikaans) and read a LitNet interview with me here (in English). You can obtain the book directly from me, off my website. Both print and three different e-book versions are available. ** Nog goeie nuus! ** ’n Afrikaanse weergawe, Kappies en goete en geite – Afrikaanse spelreëls effens anders benader, sal ook in die volgende paar maande beskikbaar wees. Hoewel die boekie uiters nuttig sal wees as alleenstaande bron uit eie reg, sal dit ook ’n verdere belangrike doel dien, naamlik as inleiding tot en aanvulling by die amptelike Afrikaanse woordelys en spelreëls, wat per slot van rekening gewoon onvervangbaar is. ’n Publikasie om na uit te sien. The primary textbook on Afrikaans spelling is the 2009 Afrikaanse Woordelys en Spelreëls (AWS) – and it is an excellent resource. Unfortunately it is relatively inaccessible, in terms of both language medium and level of presentation, to most non-native speakers of Afrikaans who need to know the rules governing the use of all those little squiggles and thingies. This highly accessible little book is about to come to your rescue. The first important – and obvious – point about it is that it is written in English, not Afrikaans. And then, instead of merely churning out a zillion rules and sub-rules I show you how to think about the conventions concerned, so that you can figure things out for yourself afterwards – in the office, in the classroom, or at home when your offspring (or theirs!) need help with their homework. 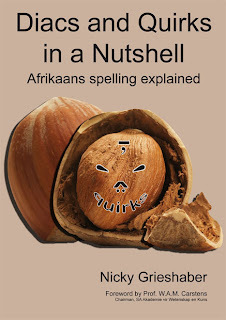 The author has succeeded in identifying the most important Afrikaans spelling issues for non-mother-tongue speakers and explaining them thoroughly, with the use of good examples. Importantly, rule changes introduced in the 1991 and subsequent editions of Afrikaanse woordelys en spelreëls (and of which many older users may still not be aware) are specifically mentioned and well integrated. The self-tests should be very helpful for readers to assess their own grasp of the rules; and lecturers, too, may find these useful. A very useful and systematic reference guide for second-language users of Afrikaans who are not familiar with the underlying principles of Afrikaans spelling, the rules that apply and the correct use of the diacritics. All the challenging subject matter, exceptions and relevant rules are clearly and systematically explained and most important of all it is written in English. Indeed a must-buy for every South African, not only for those who need it for work purposes, but also for those who are intrigued by the language itself. A valuable, comprehensive, easy-to-follow, up-to-date guide for Afrikaans spelling rules and conventions. Highly recommended for use in the classroom, home and office. A book about Afrikaans spelling in English will certainly be an asset. I understand exactly why this book was written. Problems encountered daily by language teachers and copy-editors are addressed in detail. I sometimes felt as if I was hearing myself speaking or explaining. 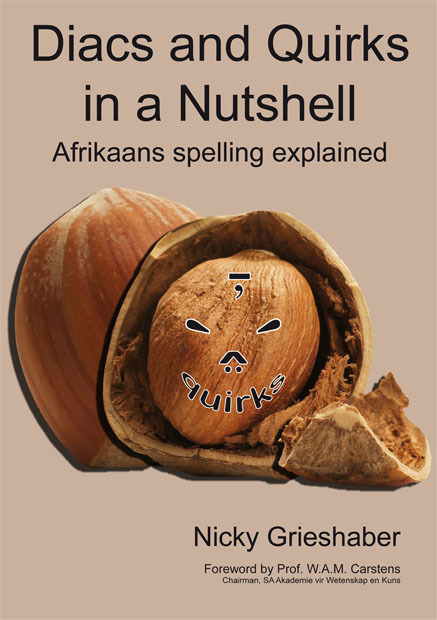 Nicky Grieshaber’s Diacs and Quirks in a Nutshell – Afrikaans spelling explained is an extremely valuable addition to the existing literature for the teaching of Afrikaans spelling. That it has been written from the perspective of second- (or even foreign-) language speakers of Afrikaans makes it all the more valuable, since it aims to explain in simple language concepts that can be difficult at times. Using the Afrikaans terms as the point of departure, and referencing Afrikaanse Woordelys en Spelreëls (AWS) throughout, also means that the user is introduced to the correct terms from the outset and becomes familiar with them. The emphasis on explanation and elucidation is also a particular asset, as it makes the text all the more accessible and user-friendly. Spelling often tends to become a neglected part of language learning, and in many classrooms it comes up only almost incidentally, quite possibly because the teachers themselves may be experiencing difficulties with the spelling system of Afrikaans. Writing that is characterised by good spelling is an object of beauty and should, therefore, be one of the goals in writing instruction processes. Afrikaans spelling is really not all that difficult to master. One simply needs a knowledge of how AWS is structured (always use the latest edition) and of the basic principles of spelling. Writing regularly in Afrikaans also has great value, as it helps to make mastering the principles even easier through practice. Spelling is, in fact, much like physical exercise – if you don’t do it regularly you will lose your fitness. I believe that those using this book will be able to spell better once they’ve worked through it. It will, of course, take time to do so thoroughly, but the rewards will be great. So: with your AWS by your side, get stuck into Diacs and Quirks in a Nutshell and practise the skills and master the contents. In due course you will reap the fruit of your labours. – Afrikaans spelling is based on three underlying principles – these are explained in this book. – Afrikaans spelling policy is formulated and revised from time by the Taalkommissie (Language Commission) of the SA Akademie vir Wetenskap en Kuns. – The Taalkommissie is responsible for the publication of Afrikaanse woordelys en spelreëls ("Afrikaans word list and spelling rules"), which contains the Afrikaans spelling rules as formulated by the Taalkommissie. – Afrikaans spelling makes a fair amount of use of so-called diacritics, or diacritic signs, or diacritic marks, to guide pronunciation. – The most recent edition of Afrikaanse Woordelys en spelreëls is the 2009 edition. Are you battling with kappies and deeltekens and other conventions relating to Afrikaans spelling? Help is at hand, courtesy of a remarkably accessible volume by Pietermaritzburg-based academic and linguist Nicky Grieshaber who understands only too well the confusion of non-mother-tongue users of Afrikaans, be it in the workplace, school, tertiary institutions or at home. Explaining that the primary textbook on Afrikaans spelling is the excellent 2009 Afrikaanse Woordelys en Spelreëls (AWS), which is unfortunately inaccessible to most non-native speakers. Written in English, Grieshaber’s book shows readers how to figure things out for themselves, rather than overwhelming readers with a zillion rules and sub-rules. The book is universally acclaimed among language practitioners and the business community. “All the challenging subject matter, exceptions and r elevant rules are clearly and systematically explained … a must-buy for every South African, not only for those who need it for work purposes, but also for those who are intrigued by the language itself,” said Christo van der Rheede, national CEO of the Afrikaanse Handelsinstituut. Nicky Grieshaber with his book. WHAT a fascinating book! It makes so much sense of what I have known but not known WHY. I can't wait to show it to my colleagues next week - it's a "must-have" in every school. I resigned from a university senior lectureship about 17 years ago to become an independent business person. I'm fluent in my country's two major "European-origin" languages, English and Afrikaans, enjoy playing lightish music on the piano, am passionate about Christian education, and enjoy cryptic crossword puzzles. I don't like Sudoku and think walking and golf are overrated, while squash is the way to go.